Express yourself instantly while berkopi ria. Only in your Toffe Coffe cafe visitors are given the opportunity to instantly display your self-expression in art. A small stage will be provided for you at the cafe located in the Riau Islands Mall this, ranging from poetry readings, sing, dance or other artistic attractions can you show. Not only that, taking the classic concept of the cafe, Coffe Toffe will also provide reading books for visitors. The design of the cafe styled really like the form of cafes began, the paintings directly to welcome you, plus jazz and classical music. It is said by Camelia as Business Owner of this cafe, he wants the Coffe Toffe bring vision in the field of art education. Artists from Malang even this long to say this cafe is known only as a place tongkrongan usual, so he tried to make a fresh new look at the cafe Coffe Toffe. Until later visitors are not just drinking coffee while relaxing, but also can be while learning the art. "Feel that I want to highlight is the arts. During this time young children are now more familiar with the band or modeling, but the literary world was even more decreased. My hope with the cafe is, can bring back a young writer of letters-particularly in Batam. Later, we will provide a small stage for visitors who want to perform, and we can coordinate it well if there are special appearances of clusters such young writers who may be joined from here, "said Camelia. To the menu calls the mainstay Coffe Toffe own more varied than any other cafe. For example, for blended coffee alone consists of many flavors, such as almonds give me, chocolacino, latte, espresso and more. 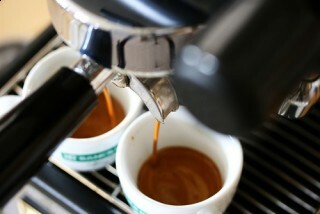 Even for an espresso is also still there are some other variants. Then adapula blended tea with a variety of flavors ranging from strawberry, blueberry, and others. In addition, during this opening, Coffe Toffe give promo 10 percent discount until the end of October. Added by Camelia, minimum Rp.20 thousand special purchase, the buyer will receive periodic discount card accepted 4 times within two weeks. Card has a discount basis, where the first use of the discount in the can by 10 percent, then the use of both worth 15 percent, and the third by 20 percent, and the final fourth valued at 25 percent. For those of you who are interested, visit the cafe soon Coffe Toffe nuanced art, only on the second floor near the door of the three Kepri Mall.